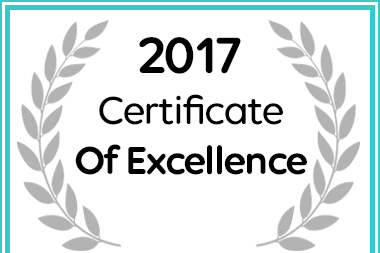 In recognition of exceptional service La Dolce Vita Guest House in Hartbeespoort has been awarded a Certificate of Excellence. From the concrete highway (NI) and take the Malibongwe (Former Hans Strydom) turn off going West at the traffic lights on to the R512. Pass Lanseria Airport. Continue on straight past the best chicken pies this side of the equator (Not a bad idea to stop and try one) and Lesedi Cultural Zulu Village lodge on your left. At the T – Junction stop turn Left towards Magaliesburg (Sasol garage on your left), carry on straight past Pecanwood Estate. Turn right at the Brits/Sun city R512 going over the Dam bridge. At the next T – Junction, turn right. About 4.5km on you will see the sign for Kosmos as well as our sign La Dolce Vita Guesthouse. Turn right into Kosmos. Follow the road past Caribbean Beach Estate and Falcon View, straight past the traffic circle and through the security gates. After the gate take the left fork into Coleman Street, you will go over two speed humps and then turn left into Becklake. Take the Platinum Highway (N4) towards Rustenburg. Take the ‘Brits/ Sandton’ turn off and turn left towards the mountains. Follow the road until you see a Sasol garage on your right hand side, turn right there. There is also a sign that says Rustenburg turn right. Follow this road passed Mount Amanzi and Castle Inn. When you reach the big four-way stop, go straight over it. Over Kommando Neck. Just on the other side you will see a turn off to your left marked ‘Kosmos’ Turn left there. Follow that road past Caribbean Beach Estate, and past Falcon View, straight over the traffic circle and through the security gates. Just through the gates the road splits – take the left split. Over two speed bumps and left onto Becklake street. Follow Becklake as it turns up and towards your right. We are the third house on your right hand side. 105 Jocelyn Street, by the 3 big palm trees.